One of the most popular and rewarding treks in the Garhwal Himalayas, Gaumukh - Tapovan - Nandanvan Circuit not only gives you the opportunity to camp at the foot of lofty Himalayan peak but it also involves crossing the massive Gaumukh Glacier, the origin of Ganga River. Gaumukh is the second largest glacier of India with 30 kms in length and 4 kms in width, first one being Siachen. The Himalayan peaks visible during this trek are Shivling, Sudarshan, Meru, Bhagirathi sisters, Kharchkund and more. The trail to Gaumukh is open for trekkers and pilgrims from May to October. 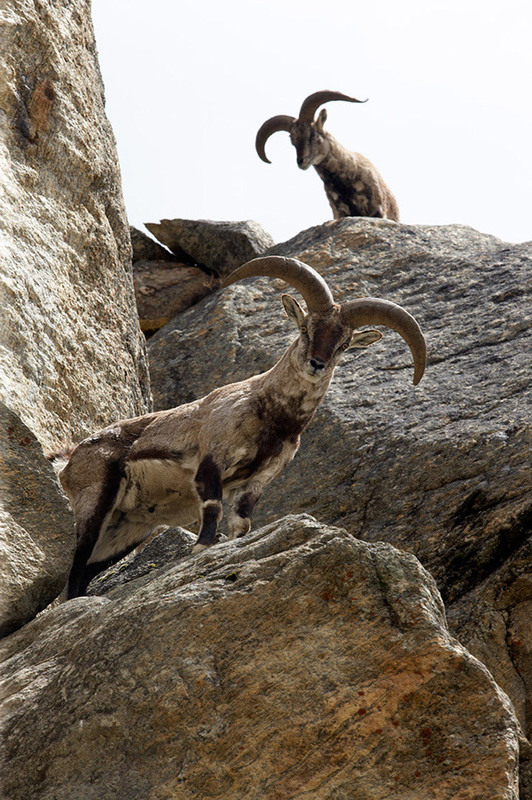 Gangotri National Park remains closed during winters as it is prone to heavy snowfall. Visit to the Gangotri Temple is a key attraction of this trek. It is one of the sacred Char Dham of Uttarakhand. Gangotri is the place from where Bhagirathi River descends. 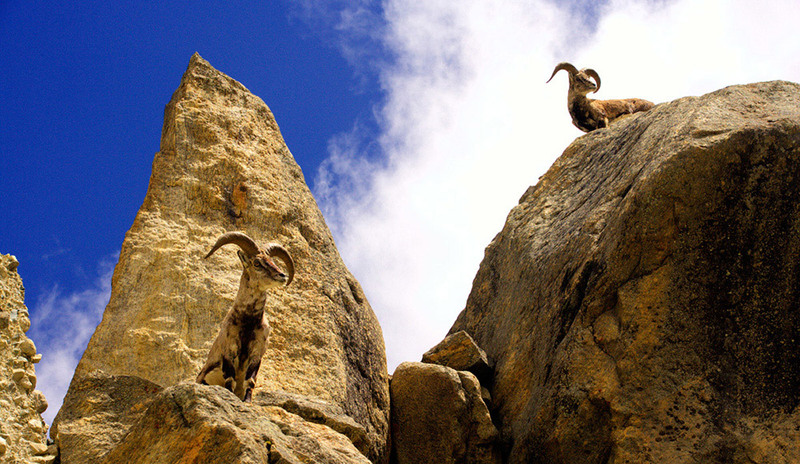 Situated at an altitude of 3,048mts above sea level, Gangotri acts as the base camp of the trek to Gaumukh Glacier. Ganga is a sacred river which nurtures the entire North India. Bhagirathi River is the most important tributary of Ganga. Gaumukh Glacier is the source of Bhagirathi River which is also referred as Ganga before its confluence with Alaknanda River at Devprayag. 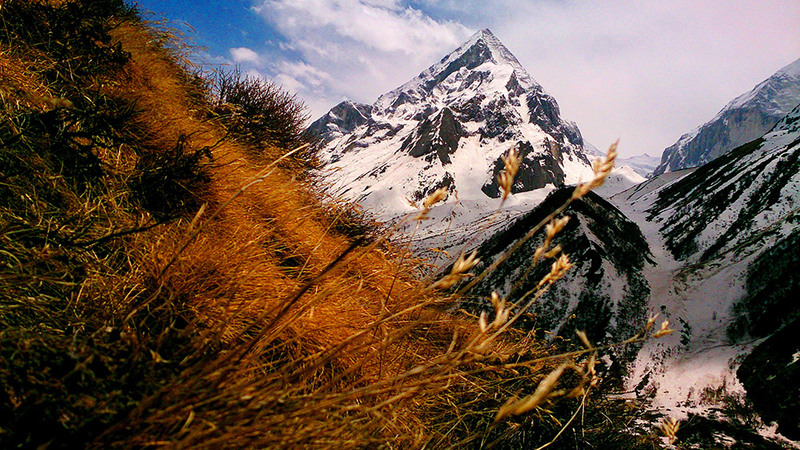 One of the most revered places in Uttarakhand, Gaumukh glacier is sightseeing in itself. The vastness of Bhagirathi peaks can be experienced from the Tapovan base camp which is near or at Gaumukh glacier. Apart from that, there is no sightseeing option except for the glacier itself.The trek to the heavenly Gaumukh has enough enchanting views and natural beauty. The trek route of Gaumukh is of moderate difficulty, it is advised to prepare for the trek by running, cycling and swimming which help improve cardiovascular stamina. Having an experienced trekking guide with you on your trek is a wise decision as he/she would know the route well and will help you keeping on track. Avoid trekking in the monsoons season. The incessant rains in monsoon make route slippery and the region is prone to unexpected landslides, cloudbursts and road blocks. Make sure you are travelling in a group of two or more. Venturing out alone wouldn’t be advisable. Also, make sure you have informed someone about your plan back home. Literally meaning ‘mouth of a cow’, Gaumukh is the glacier from where Bhagirathi River originates. It is a well-known pilgrimage destination as well as the trekking destination. For environmental reasons, camping and staying overnight is not allowed at Gaumukh. Instead, one can find accommodation including GMVN guesthouse at Bhojbasa which is just 4.5 kms from Gaumukh. Trekkers usually indulge in a day trek to Gaumukh and return to Bhojbasa by evening. Since there is no village or melt at this elevation, finding a foodstall or dhabas is not possible at Gaumukh. The only food you can have is the one you take with yourself on trekking. There are quite a few local restaurantsand dhabas in Bhojbasa where one can savor North Indian vegetarian dishes and authentic Garhwali cuisine. According to the Hindu mythology, Gaumukh is the source of the holy river Ganga which is revered by the Hindus. According to a local legend, once a shepherd boy came across the glacier in Gangotri, while searching for his lost sheep and named the glacier as ‘Gomukh’ due to its striking resemblance to the mouth of a cow. From then onwards, many sage, hermits, religious people and travellers went there to worship the place. Gaumukh has also been mentioned in the Puranas. Uttarkashi is a major town of Uttarakhand. Buses and shared cabs are easily available from Dehradun and Rishikesh to reach Uttarkashi. You can board shared cabs to Uttarkashi from Rispana Pul in Dehradun. The drive to Uttarkashi takes 6hrs from both Dehradun & Rishikesh. The road from Dehradun passes through Mussoorie Bypass Road offering scenic views whereas the road from Rishikesh goes through Chamba Hill Station. The massive Tehri Dam Lake also comes into view as you proceed towards Chilyanisaur. It takes another 4hrs from Uttarkashi to reach Gangotri via Harsil. If you start from Dehradun/Rishikesh at around 6am then you will probably reach Uttarkashi by 12 Noon. Take another shared cab to Gangotri from Uttarkashi. Perform evening aarti at Gangotri Temple and obtain the permits to enter Gangotri National Park. 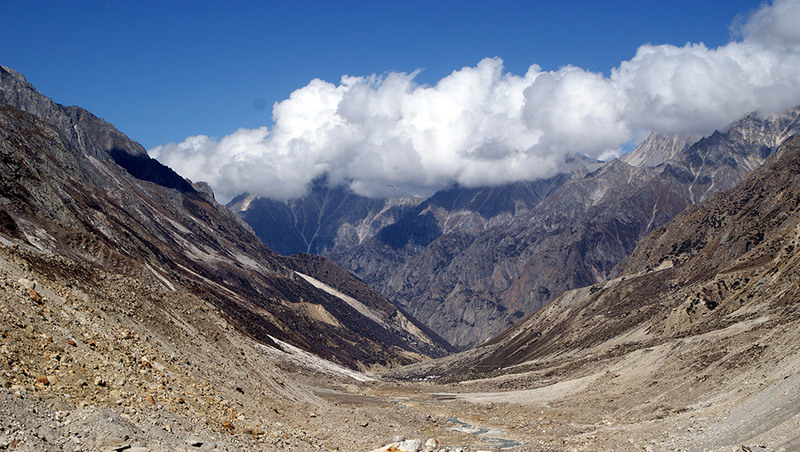 Forest Permits are necessary to enter Gangotri National Park. First thing in the morning, visit the sacred shrine of Goddess Ganga - Gangotri Temple. You can buy necessary items from the market at Gangotri town. The trek starts from Gangotri itself. You need to show permits at Forest Check Post, 2kms from Gangotri. As you walk deep into the valley the vegetation also decreases. Continue trekking to reach Chirbasa, located 9kms from Gangotri. The route involves crossing small streams en route to Chirbasa. Chirbasa makes a good campsite and it is also the last point where you'll see good vegetation. You can camp here if there are any signs of AMS or if you are tired. Chirbasa is situated at an altitude of 3, 580mts above sea level. Bhojwasa is located 5kms ahead of Chirbasa. Bhagirathi Peaks are constantly visible during the trek. Bhojbasa is an open expanse of land in the valley, situated at an elevation of 3,800mts above sea level. There are few ashrams at Bhojwasa where pilgrims stay. Tapovan can be reached by two routes. The first one is the classic route which goes via Gaumukh Glacier. 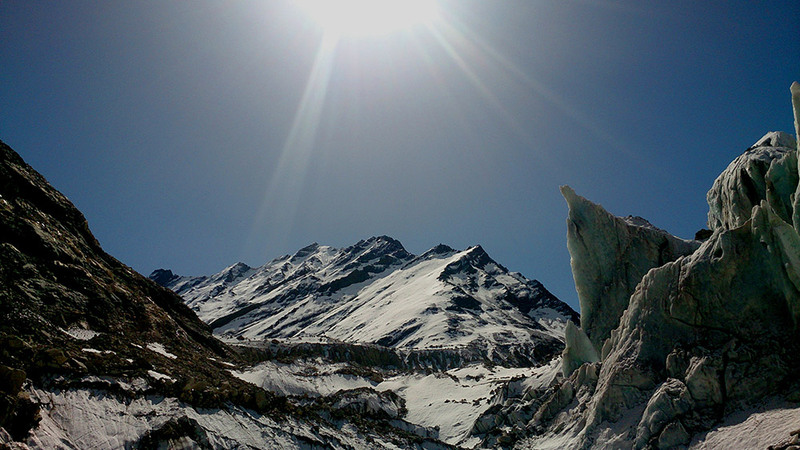 Gaumukh Glacier is 5kms from Bhojwasa. After reaching Gaumukh Glacier you need to traverse the glacier and climb a rugged wall to reach Tapovan. For accessing second route crossing Bhagirathi River from Bhojwasa itself is required. A long walk on moraine and small ridges for many kilometers will end up at Tapovan. Distant view of Gaumukh Glacier can be seen from this trail. Tapovan campsite is located at the foot of Mount Shivling (6,543mts). Tapovan is situated at 4400mts above sea level. Crossing the massive Gaumukh Glacier is required to reach Nandanvan from Tapovan. The trek starts with steep descent from Tapovan to reach the glacier and ends with steep climb of approximately 100mts to reach Nandanvan. Nandanvan (4450mts) is situated at the foot of Bhagirathi Peaks. Trek down to Gaumukh Glacier. The snout of Gaumukh Glacier used to look like a cow's face, but you won't see any such resemblance now. This is the origin of Holy Ganges. Further trek down to reach Bhojbasa . 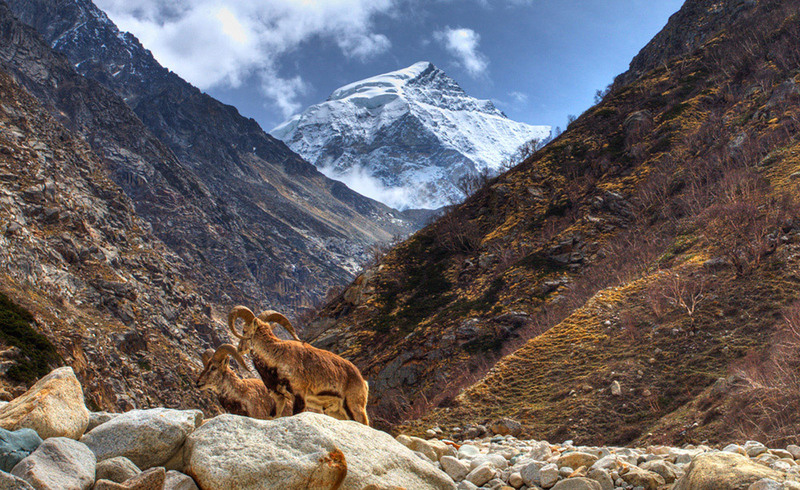 Trek down to Gangotri. It will take around 5-6hrs to reach Gangotri from Bhojwasa. What is Gaumukh Trek famous for? Gaumukh Trek is famous among tourist as Soure of River Ganga, Glacier, Trekking, Camping, Religious, Adventure. Gaumukh Trek is recommended destination for Foreigners, Groups, Solo. Gaumukh Trek is popular destination for following activities/ interests - Adventure, Glaciers, Trekking. Travelling to Gaumukh Trek in 2019? Contact us for planning your Gaumukh Trek tour with best travel packages of as per your requirements!